Hundreds of short films appeared at the 2019 Pan African Film Festival. Some of them tell thought provoking stories including racism, sexism, horror, and even comedy. One of those films sparked conversations regarding colorism. “Colors of Sankofa” tells the story of a Ghana born woman named Elyse. She seeks a second in command at her business and finds an applicant from her past. Adeline, who once bullied Elyse because of her skin color, dwells into a deep conversation about their history. The L.A. Watts Times News­paper spoke with actress Tye Myers who plays Elyse and executive producers Adrienne Reed and Jalen Blot. L.A. Watts Times (LAWT): Where does the name “Colors of Sankofa” originate? Adrienne Reed (AR): Sankofa is an African term specifically coming from the folks of Ghana. It means to go back and fetch it. We came up with it because our film is about the inclusion of colors. We wanted to tie in our Ghana main character Elyse. It makes sense because just like the term, she has to go back to her past which is an over arching theme of the film. LAWT: Tye, since your playing the role of a main character who experiences colorism, has that ever been introduced in your own life? Tye Myers (TM): In my own life it’s been a minimum but when this role came out, I immediately called my mom because she has dealt with colorism. Growing up in Michigan, I spoke to her about how she felt. It really hit home for her. Growing up she felt ugly so personally this role really touched me in dealing with my mom’s experience. LAWT: In the film, Elyse speaks about her journey with navigating through colorism at the workplace. Can you elaborate on that theme? Jalen Blot (JB): One theme we wanted to tackle is how colorism is perceived in the workplace. We not only see other races doing it but also our own. So in the film, we highlight how her name speaks to her work ethic. We really wanted to show how she built herself up despite the name barrier. AR: I think it’s also important to show colorism in a practical way, especially in everyday scenarios. 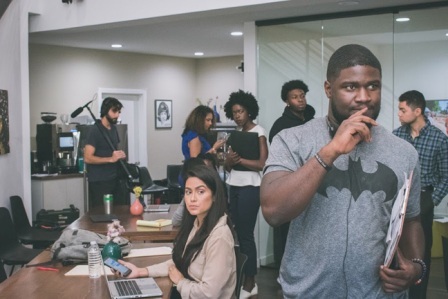 We wanted to make sure we portray what journey it took to ensure that someone does not negatively impact your success because they don’t understand your culture. LAWT: How can Hollywood address the problem of colorism? AR: They can start by creating goals and opportunities for actors of color. We have recently seen an increase but still it’s a small step. Also, selecting casting directors who are familiar working with actors of color. We see a lot of darker skin men in roles but those opportunities aren’t granted for darker women. We are beyond conversations at this point. It’s time to take actions that moves us forward. LAWT: Since this is only a short film, is there any room to expand on the story? AR: If we had the opportunity to expand on “Colors of Sankofa” it would be through the eyes of a child. It’s important that people understand that colorism begins early. There is an underlying messaging about the development of superiority and elitist mind that happens at home. I relate to that personally because I am a lighter skin woman. I come from a family of multiple hues. The lighter members were treated better. It wasn’t until I started having conversations with my darker grandmother who explained the reality of what was going on. 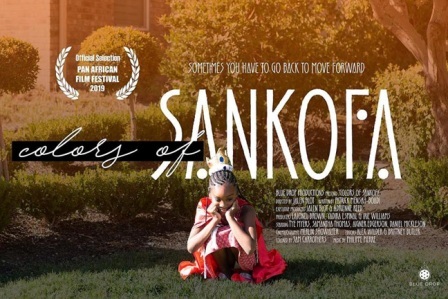 “Colors of Sonkofa” premiered at the 2019 Pan African Film Festival.